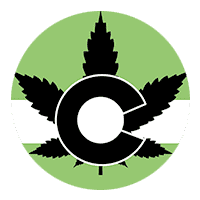 420 – Up In Smoke Sale! Get Up In Smoke This 420! 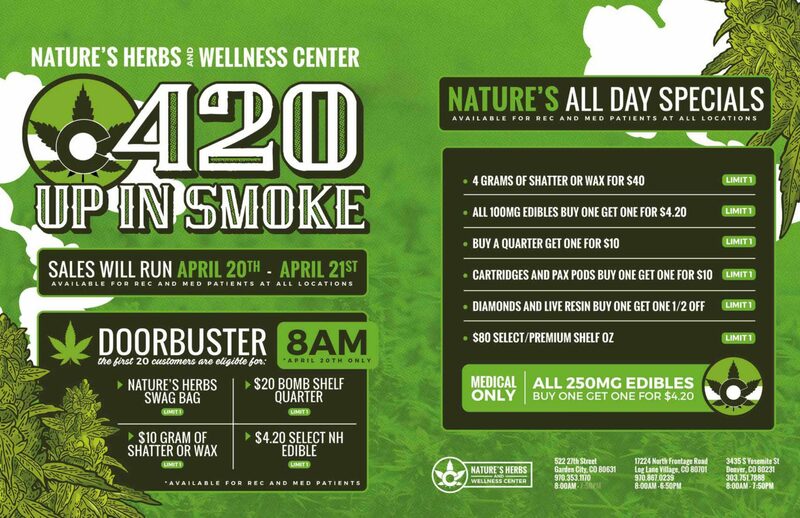 Nature’s Herbs and Wellness is celebrating the 420 Weekend on both Saturday 4/20 and Sunday 4/21! Doorbuster Deals available to the first 20 customers on 4/20! All Day Deals on 4/20 and 4/21! Deals available at Nature’s Herbs recreational and medical locations in the Denver Tech Center, Garden City and Log Lane Village! Looking for even more great deals? Check out our Daily Specials! Nature’s Herbs and Wellness now has New Flower Pricing! Nature’s Herbs and Wellness is celebrating with some Green on Friday, March 15th through Sunday, March 17th! It’s The Season Of Love! 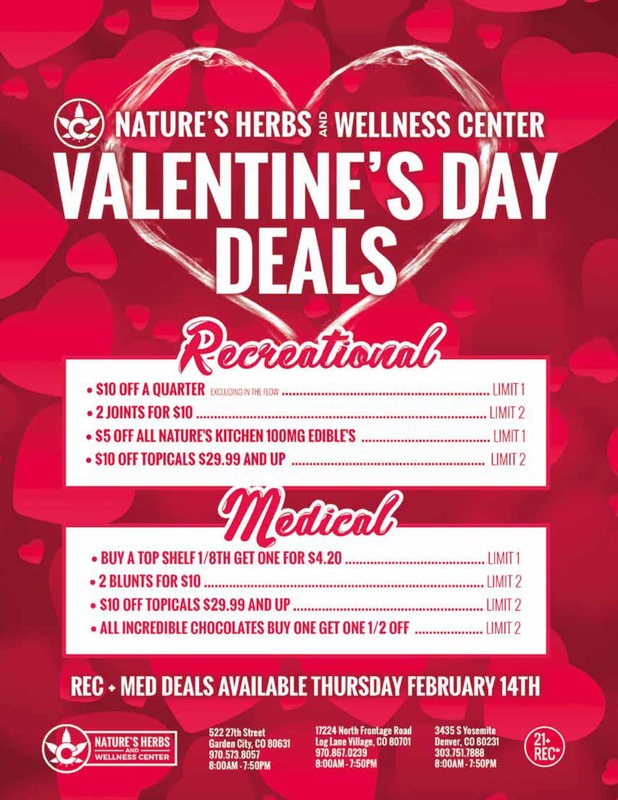 Nature’s Herbs and Wellness wants to show you some love on Thursday, February 14th with our Valentine’s Day Deals! Kick Off Game Day with Big Savings! 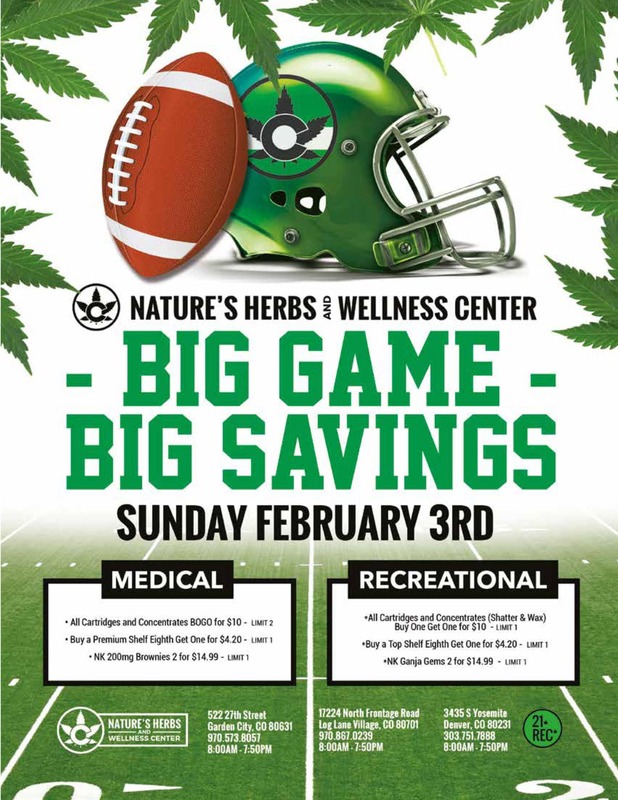 Join Nature’s Herbs and Wellness on Sunday, February 3rd as we celebrate the big game! Become a Loyalty Member today! Sign up in store and receive an extra 10% off every purchase! That makes this ounce only $54 with cash back in your loyalty account! 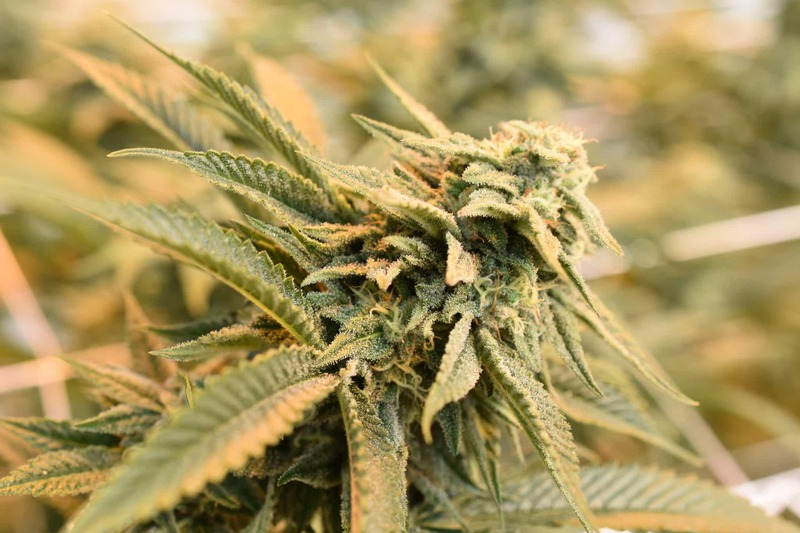 Deal available at Nature’s Herbs recreational locations in the Denver Tech Center and Garden City! Looking for even more awesome discounts? Check out our Daily Specials here! Pop Up Sale at Nature’s Herbs and Wellness! There are currently no Pop Up Sales, check back often! Deal available at all Nature’s Herbs recreational locations in the Denver Tech Center, Garden City, and Log Lane Village! 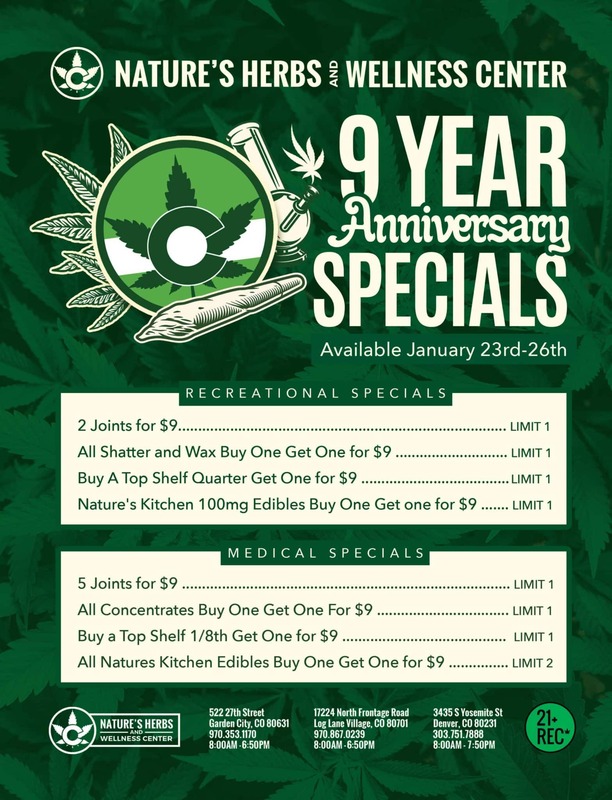 Nature’s Herbs is celebrating our 9 Year Anniversary, and we can’t do it without you! Over the last 9 years at Nature’s Herbs we have always been dedicated to providing top of the line products and excellent customer service that has every individual who walks through our doors leaving with a smile. Our wonderful customers make all of this worth it. So, thank you for being apart of Nature’s Herbs! Deals available at all Nature’s Herbs locations in the Denver Tech Center, Garden City, and Log Lane Village! What a great year it’s been! 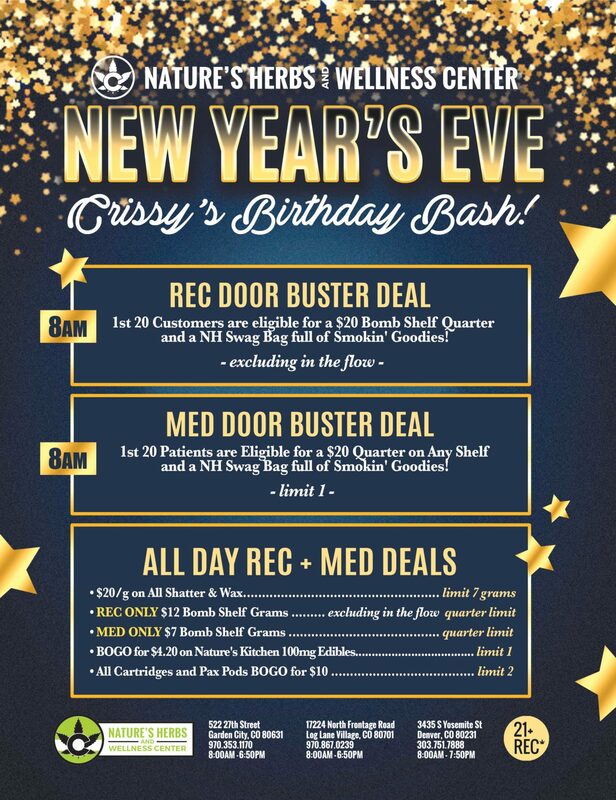 Nature’s Herbs and Wellness is ending 2018 in style, join us for Crissy’s Birthday Bash! 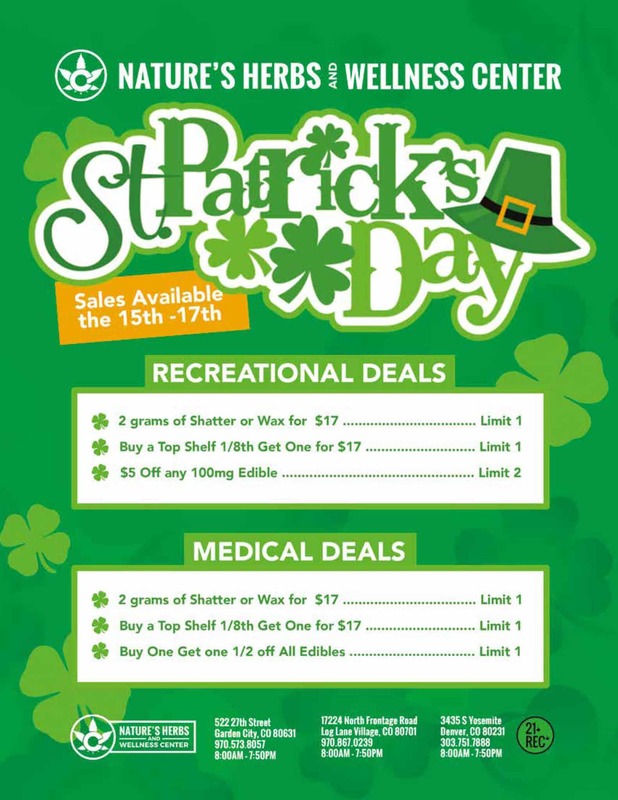 Door Buster Deals for both Medical and Recreational, plus All Day Deals on your favorite products! Join us on December 24th as we celebrate Christmas Eve! 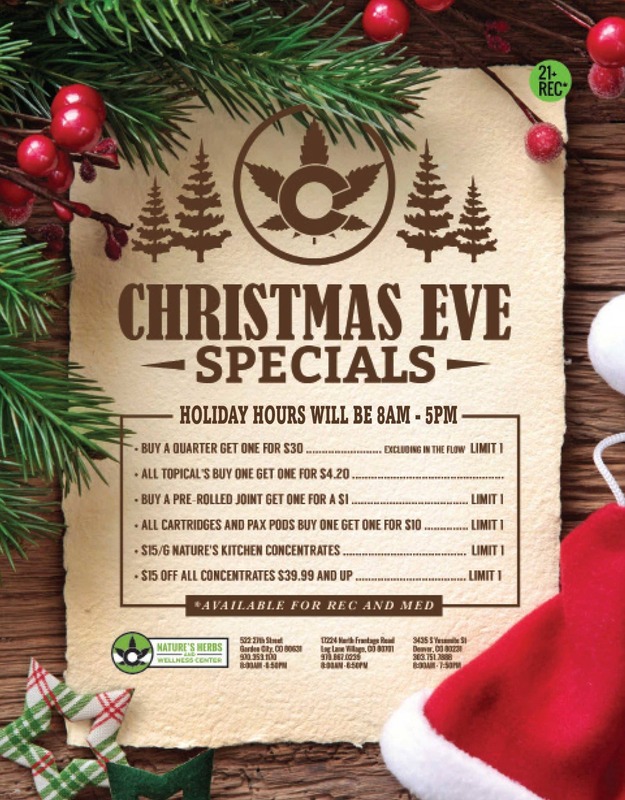 All locations will be open from 8am to 5pm on Christmas Eve, and will be Closed on Christmas Day. Happy Holidaze!